Background and objectives: Intrapatient variability of hemoglobin (Hb) is a newly proposed determinant of adverse outcome in chronic kidney disease (CKD). We evaluated whether intensity of epoetin therapy affects Hb variability and renal survival in nondialysis CKD. Design, setting, participants, & measurements: We calculated the individual therapeutic index (TI) for epoetin (EPO; difference between rates of visits that required EPO dosage change and those with effective EPO change) from 1198 visits during the first year of EPO in 137 patients. Renal death was registered in the subsequent 18.1 mo. Analysis was made by TI tertile (lower, middle, and higher; i.e., from more to less intensive therapy). Results: Main features and visit number were similar in tertiles. 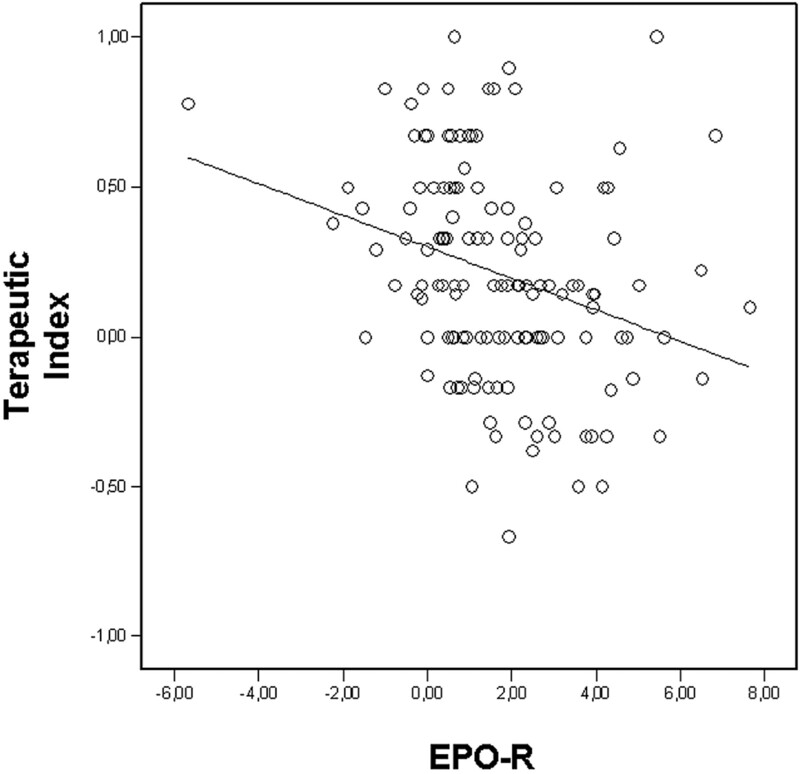 Lower Hb response to first EPO dosage was an independent predictor of higher TI (P = 0.002). The area under the curve for Hb (11.56 ± 0.87, 11.46 ± 1.20, and 10.95 ± 1.48 g/dl per yr; P = 0.040) decreased from lower to higher tertile. Hb variability increased in parallel, as shown by the reduction of time with Hb at target (time in target, from 9.2 ± 2.0 to 3.0 ± 2.2 mo; P < 0.0001) and the wider values of within-patient Hb standard deviation (from 0.70 to 0.96; P = 0.005) and Hb fluctuations across target (P < 0.0001). In Cox analyses (hazard ratio [95% confidence interval]), risk for renal death was increased in the middle and higher tertiles (2.79 [1.36 to 5.73] and 2.94 [1.40 to 6.20]) and reduced by longer time in target (0.90 [0.83 to 0.98]). Conclusions: Lack of adjustment of EPO worsens Hb variability in CKD. Hb variability may be associated with renal survival, but further studies are needed to explore the association versus causal relationship. Nondialysis chronic kidney disease (CKD) has been identified as a major area to focus on to reduce cardiovascular risk and limit the number of patients who reach ESRD (1,2). In this picture, anemia emerges as a main complication of CKD to treat because it acts as an independent risk factor for worsening of cardiovascular and renal damage (3–8). Despite recommendation of international guidelines to set the minimum acceptable hemoglobin (Hb) value at 11 g/dl (9,10), achievement of the Hb target is frequently unmet (3,11–15). This observation can be the consequence of the lack of epoetin (EPO) treatment or individual Hb fluctuations or both. Indeed, on the one hand, omission of therapy with EPO is frequent throughout the whole spectrum of CKD (3–8,11–16); on the other hand, several studies have reported that in treated patients, transitory reductions of Hb levels below target range are common and associated with worse outcome (17–22). Specifically, in nondialysis patients with CKD, we found that intrapatient Hb variability occurred frequently, with most patients showing a limited extent of time spent with Hb at target (time in target), and that short time in target is associated with lower renal survival (21). Our previous study, however, left unanswered a critical question: Whether stability of Hb depends on individual responsiveness to EPO or intensity of therapeutic intervention. In particular, verifying the latter hypothesis becomes essential when one considers the high rates of “undertreatment” of CKD complications in nondialysis patients (12,13,23,24). A useful clinical tool to evaluate whether drug prescription is tailored to patient responsiveness is represented by the individual therapeutic index (TI). This score, originally used to verify retrospectively the intensity of antihypertensive therapy in essential hypertension and diabetes (25–27), allows to disclose therapeutic inertia—that is, the provider's failure to modify therapy despite recognition that treatment goals are unmet (28). For the first time, we applied this method in nondialysis patients with CKD to evaluate whether intensity of EPO therapy affects Hb variability and renal survival. We conducted in two Italian academic outpatient renal clinics a retrospective study of consecutive adult nondialysis patients who had CKD and anemia (Hb <11 g/dl in two consecutive visits with interval >15 d) and started for the first time EPO between April 30, 2002, and October 31, 2005. To evaluate properly changes of Hb levels over time, we excluded patients with Hb levels monitored after the first dose of EPO for a period ≤10 mo and/or at intervals of >2 mo. Patients with incomplete data, neoplastic or infectious disease, hemoglobinopathies, and bleeding or blood transfusion in the 3 mo before the study were also excluded. Data were collected during the first year of EPO therapy (baseline period). Thereafter and until March 31, 2008, only the occurrence of renal death was registered (follow-up for renal death). The two centers are in the same city, belong to the national public health care system, and share the following features: Presence of outpatient clinic for the conservative care of CKD with in-house analysis of blood and urinary samples and EPO dispensed by the hospital pharmacy and presence of clinical and laboratory standardized protocols, including measurement of creatinine by modified kinetic Jaffé reaction, Hb by Coulter counter, C-reactive protein by nephelometry, and proteinuria by pyrogallol red-molibdate method. The two renal clinics are run by eight nephrologists who personally follow the same patients with CKD from the first visit to the beginning of substitutive therapy. All of the participating nephrologists stated that since 2002, their reference for conservative care of CKD has been Kidney Disease Outcomes Quality Initiative (K/DOQI) clinical practice guidelines and successive updates. In particular, EPO treatment is initiated when Hb is <11 g/dl in two consecutive control visits and targeted at Hb 11.0 to 13.0 g/dl. TI was calculated for each patient as the difference between the rate of expected EPO dosage change (number of visits requiring dosage change/total number of visits) and the rate of observed changes (number of visits in which dosage was effectively changed/total number of visits) (25–27). We identified four conditions to define the visits that required dosage change: (1) Hb value <11 g/dl with an Hb increase <1 g/dl/mo, (2) Hb value >13 g/dl, (3) presence of Hb increase between two consecutive visits >2 g/dl/mo, and (4) Hb value ≥11 g/dl with an Hb decrease >2 g/dl per mo. For TI calculation, we considered all of the control visits of the first year of EPO; that is, excluding the basal one, in which all patients had anemia and received EPO for the first time. This method uses a scoring range from +1 to −1, with higher scores indicating less intensive therapy. As an example, a patient with six visits after the basal one and with Hb <11 g/dl and Hb increase <1 g/dl per mo in three of those visits has an expected dosage change rate of 3/6 = 0.5. If the dosage were increased in one of the six control visits, then the observed dosage change rate would be 1/6. TI score, therefore, is 3/6 to 1/6 = 0.33; that is, changes of EPO therapy were made in 33% fewer visits than expected. A similar method was used to calculate intensity of therapeutic approach to iron deficiency, with need for iron supplementation defined by serum ferritin <100 ng/ml and/or transferrin saturation <20%. Outcome variables during the baseline period were the measures of Hb variability, such as Hb fluctuations (18,19), residual standard deviation (SD) (20), within-patient SD for Hb (29), and time in target (21). We also calculated the area under the curve for Hb (Hb-AUC) to define the time-weighted average of Hb levels. All of these variables were summary measures (i.e., calculated using individual data from all of the single visits) (30). Individual Hb responsiveness to the first administration of EPO (EPO-R; g/dl per 10,000 IU/mo) was defined as the ratio between Hb change from basal visit to the first control and EPO dosage prescribed at basal visit. To allow comparison in EPO dosage for patients who underwent shift of EPO type, we standardized the dosage of darbepoetin in μg to IU by using the conversion factor of 1 μg = 200 IU in accordance with the manufacturer's recommendations within the European Union. For each patient, we also calculated GFR by the four-variable Modification of Diet in Renal Disease (MDRD) study equation, daily protein intake (31), and the Charlson Comorbidity Index (32). To assess the effects of TI, we stratified patients by TI tertile (lower, middle, and higher; i.e., from more to less intensive EPO therapy). Continuous variables are reported as mean ± SD and compared with paired t test and one-way ANOVA with Bonferroni as post hoc test. Variables with a non-normal distribution at Shapiro-Wilk test are reported as median (range) and analyzed by Wilcoxon or Kruskal-Wallis test. Categorical variables are expressed as percentage and analyzed by χ2 test. Differences in TI values among physicians were assessed by means of intracluster correlation coefficient with 95% confidence intervals (95% CIs) (33). Linear regression analysis was used where indicated. Determinants of TI value were identified by a mixed regression model that accounted for the physician effect and included the potential factors associated with intensity of EPO therapy. For survival analysis, the primary composite end point was time to renal death, defined as time from end of baseline period to all-cause death or dialysis or renal transplantation, whichever occurred first. Multivariate Cox proportional hazards model was used to estimate adjusted hazard ratio (HR) and the corresponding 95% CI, stratified by physician. We also tested two more Cox regression models using the same covariates but replacing TI with either time in target or Hb-AUC. Data were analyzed using SPSS 12.0 (SPSS, Chicago, IL). We identified by inclusion criteria 179 patients; 42 met exclusion criteria (monitoring <10 mo, n = 6; interval between two Hb determinations >2 mo, n = 27; incomplete data, n = 9), so we finally studied 137 white patients. Data were collected from the 1198 visits (137 basal visits and 1061 control visits) performed during 12.0 ± 0.7 mo of the first year of EPO. The median number of visits during this period was 7 (range 7 to 12). Analysis of single visits revealed that 471 (44%) of 1061 control visits required a change of EPO dosage, but this occurred in only 251 (53%) of 471. TI ranged from −0.67 to 1.00 (median 0.17); the same value was detected in the three CKD stages (P = 0.308). The estimated intracluster correlation coefficient of TI value was 0.12 (95% CI 0.02 to 0.42), indicating that TI for patients who were seen by the same physician were more similar than TI between patients who were seen by different physicians. When patients were grouped in tertiles of TI (lower, TI ≤0; middle, TI 0 to 0.33; and higher, TI >0.33), no difference emerged in demographic and the several basal characteristics examined (Tables 1 and 2). Similarly, neither previous nephrology follow-up (17 mo on average) nor the number of visits during the baseline period differed among TI tertiles (P = 0.429 and P = 0.926, respectively). In particular, basal BP was ≤130/80 mmHg in 38% of whole cohort, and no patient had BP >160/100 throughout the study; most patients, in fact, were treated with multiple antihypertensive therapy (2.6 ± 1.0 drugs on average). Iron deficiency (serum ferritin <100 ng/ml and/or transferrin saturation <20%) was detected in 54, 44, and 45% from lower to higher TI tertile, respectively (P = 0.584). Basal Hb levels were similar in the three TI groups (Figure 1); however, significant differences emerged in the subsequent visits. On average, in fact, Hb reached the 11- to 13-g/dl range at first control visit and persisted within target range until the end of the first year of observation in lower and middle tertiles, whereas target achievement was delayed and Hb values were significantly lower until the end of the observation period in the higher tertile. Hb-AUC, in fact, decreased from lower to higher tertiles (11.56 ± 0.87, 11.46 ± 1.20, and 10.95 ± 1.48 g/dl per yr, respectively; P = 0.040). 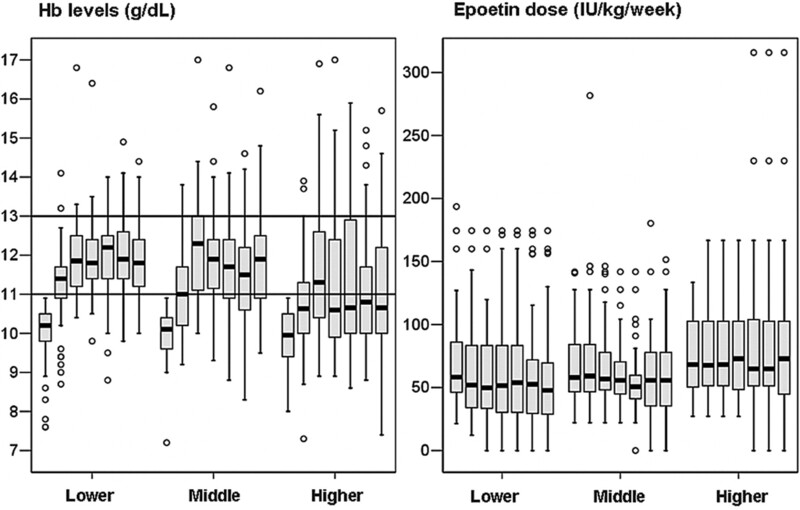 Box plots of hemoglobin (Hb) levels and epoetin (EPO) dosages before during first year of EPO therapy in patients stratified by tertiles of therapeutic index. Limits of boxes are 25th and 75th percentiles, with the thick line across the boxes being the median value. Whiskers indicate either the minimum and maximum values or a distance of 1.5 times the interquartile range from the edge of the box (whichever distance is smaller). The circles beyond the whiskers indicate outliers. Accordingly, the percentage of visits with Hb at target diminished (86 ± 15, 71 ± 22, and 40 ± 31%, respectively; P < 0.0001). These differences occurred in the presence of similar type and scheduling of EPO therapy and iron supplementation (Table 3). Also the TI value for iron therapy was similar in the three groups (P = 0.318). EPO dosages, which were self-administered subcutaneously by all patients, did not differ at basal visit, whereas it was significantly greater, from second to last visits, in the higher tertile versus other tertiles (Figure 1). In the higher tertile, the smaller Hb increment at first visit after baseline, being detected in the presence of similar first EPO dose, resulted in a lower value of EPO-R (0.93 ± 2.12 versus 2.32 ± 1.66 and 1.97 ± 1.99 g/dl per 10,000 IU/mo in lower and middle tertiles, respectively; P = 0.002). Linear regression analysis confirmed the inverse relationship between EPO-R and TI value (Figure 2), which persisted significantly after adjustment for potential confounders and physician effect (Table 4). Scatterplot of therapeutic index by Hb responsiveness to first dose of EPO. R2 = 0.088, P < 0.0001. A larger intrapatient Hb variability became manifest from lower to higher tertiles, as evidenced by the shorter time in target, which was due to the longer time spent with Hb <11 g/dl rather than from time spent with Hb >13 g/dl, as well as by the larger prevalence of Hb fluctuations and the greater within-patient SD (Table 5). During the study year, no bleeding or blood transfusion was reported. Seven patients experienced an acute infection episode (five in the urinary tract and two in the upper respiratory tract), and six patients required hospitalization because of nonfatal cardiovascular events. These 13 patients were homogeneously distributed in the three tertiles and did not interrupt or change the dosage of EPO during the event. In the 18.1 mo (0.9 to 72.9) subsequent to the month 12 visit, renal death occurred in 82 patients (67 started dialysis and 15 died); occurrence of the combined end point increased from lower to higher tertiles (44, 64, and 74% of patients). This finding was confirmed in fully adjusted Cox analysis (Table 6). When this analysis was repeated by including the same covariates but time in target instead of TI, a longer time with Hb 11 to 13 g/dl was associated with a lower risk for renal death (HR 0.90; 95% CI 0.83 to 0.98; P = 0.016); conversely, the occurrence of combined end point was not predicted by Hb-AUC (HR 0.81; 95% CI 0.60 to 1.08; P = 0.154). K/DOQI guidelines on CKD strongly recommend the review of drug treatment at each visit for appropriateness to slow progression of kidney disease, reduce cardiovascular risk, and optimize disease management (34). This advice becomes particularly important when focusing on adequacy of anemia treatment because of the narrow target range for Hb. We found that for patients who had CKD and were regularly followed and treated in renal units, a change of EPO dosage occurred for only half of control visits when it was expected, suggesting that lack of EPO dosage adjustment was prevalent in this cohort. A strict inverse correlation was detected between EPO-R and TI values (Figure 2, Table 4), indicating that a lower responsiveness to first EPO dose is associated with less intensive EPO treatment in the subsequent visits. Indeed, as compared with lower and middle tertiles, patients in the higher tertile were actually administered higher dosages of EPO from the second visit until the month 12 visit; however, the dosages in that group, even though higher versus the other two groups, were not further increased despite the lower Hb levels detected (Figure 1). Of note, EPO dosage remained unmodified also in the other two groups of patients who, however, were per se characterized by greater responsiveness and therefore required any or only minor changes of EPO dosages. The different responsiveness among tertiles may be theoretically ascribed to differences in the traditional factors of EPO resistance (31,35); however, against this hypothesis, higher tertile was not characterized by worse clinical conditions, as evidenced by analysis of comorbidities, iron status, parathyroid hormone, or nutritional or inflammatory status. Also, use of renin-angiotensin system inhibitors was similar. It is therefore possible to hypothesize that entity of response to EPO was of biologic nature and independent from the recognized factors of EPO resistance. The reason for the lack of dosage adjustment in the higher tertile is not readily apparent. Such a cautious approach may be ascribed to the fear of the negative effects of the high dosages of EPO. This issue, however, has been brought to the attention of nephrologists only recently (36,37)—that is, after our data collection. More important, in the higher tertile, EPO was administered at dosages that were higher but still three-fold lower than those previously associated with worse prognosis (37). Alternatively, it is possible to hypothesize a physician's overestimation of global care that they provide in terms of multiple pharmacologic and nonpharmacologic intervention required by the several CKD-associated complications. Missed intervention influenced the quality of anemia control. A slightly lower Hb-AUC value was in fact detected from lower to higher TI tertile. Notably, of greater magnitude was the parallel increase of intrapatient Hb variability (Table 5). Among the measures of Hb variability examined, time in target was previously tested only in nondialysis CKD by our group (21), whereas the other three measures—Hb fluctuations, within-patient SD of Hb, and residual SD—have been exclusively calculated in dialysis population (17–20,29). We here provide first-time evidence of concordance of all of these measures but residual SD in identifying Hb variability in nondialysis CKD. Increasing TI was also associated with a greater risk for renal death (Table 6). This finding is likely related to the shorter time in target that was mainly due to downward Hb fluctuations that, in turn, have been claimed to be associated with repeated ischemic insults and, therefore, with worse prognosis (20–22,38). The finding that at variance with the length of time in target Hb-AUC was not a significant predictor of outcome is in agreement with the results of previous studies (19–22). Those studies and this one support in fact the hypothesis that the entity of transitory Hb fluctuations are captured more efficaciously by specific measures of Hb variability than mean Hb values, even if time weighted as in this work. Of note, the results of this work are hypothesis generating and must not be overinterpreted because of the limitations inherent to the design. Sample size was small; however, to address the issue properly, we had to conduct the study in the relatively limited group of patients with at least one complete evaluation every 2 mo. Furthermore, the observational nature of this study cannot prove any cause–effect relationship. The associations detected therefore deserve an in-depth evaluation by means of ad hoc trials; however, randomized, controlled trials on this issue are of difficult design because ethical objections prevent constitution of a control group where intervention is not based on the actual recommendations of tailoring EPO dosage on individual response. Lack of adjustment of EPO worsens Hb variability in non-dialysis patients with CKD. Hb variability may be associated with renal survival, but further studies are needed to explore the association versus causal relationship described herein. This study was presented at XLV ERA-EDTA Congress; May 10 through 13, 2008; Stockholm, Sweden. This study was published in abstract form (Nephrol Dial Transplant Plus 1[Suppl 2]: 148, 2008.